Chestnuts, open fires, sleighs, donkeys, little drummer boys… there are some Christmas stalwarts that never fail to conjure up the festive season – and Charles Dickens’s classic A Christmas Carol is undoubtedly one of them. The Old Vic’s acclaimed production, running until 19 January, has been adapted by Jack Thorne and directed by Matthew Warchus. There’s yuletide cheer in spades – with a few tears too. Here are some reasons to see the heart-warming show! 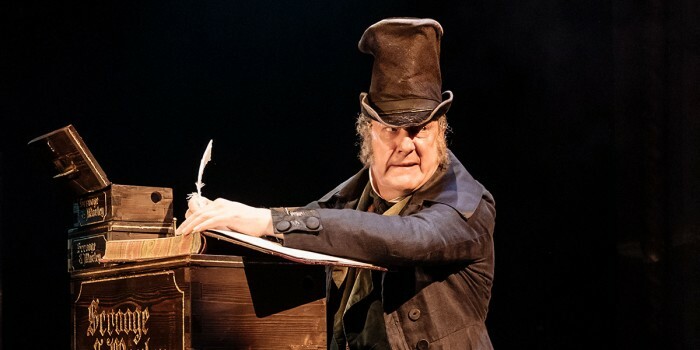 Stephen Tompkinson dons the classic top hat and mutton chops of the famous anti-hero, and his transformation from cantankerous, bah-humbugging miser to childlike wonder and repentance would bring a tear to the eye of the most hardened, well… Scrooge. 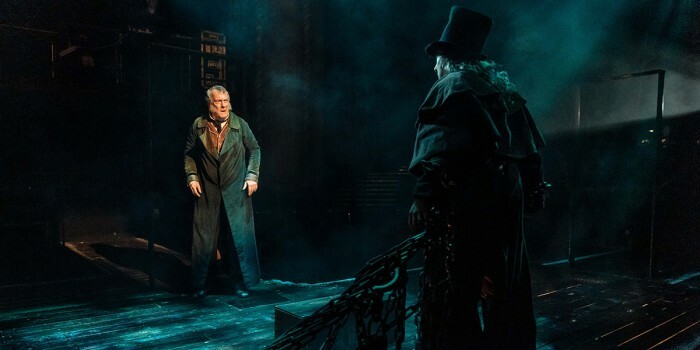 This production delves deeper than some into the hardships and lost loves of Scrooge’s upbringing which shaped him, and the tragic missed opportunities of his life are balanced movingly by the catharsis of his redemption. Few of the Old Vic audience might have imagined they’d end up watching a bucket-load of vegetables cascading down a long white sheet directly over their heads, or helping pass a comedy string of sausages to the stage – but they reckoned without the joyous enthusiasm of a newly festive Scrooge. From a young boy seconded from the crowd to carry a huge jelly, to a shower of parachuting sprouts and a thick dusting of foamy snow, Christmas chaos of the best kind ensues. 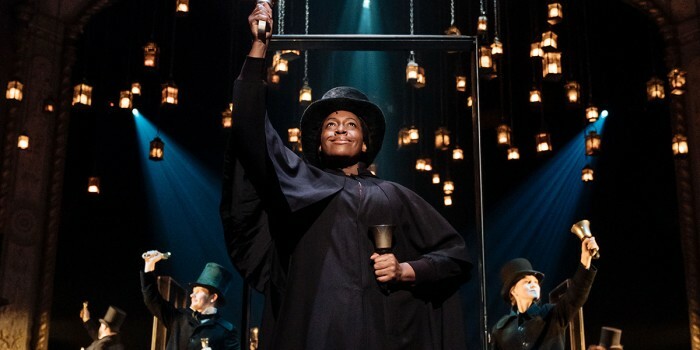 A multi-talented cast is always a bonus, and The Old Vic has managed to pull together a stellar ensemble who – as well as being fabulous actors – prove rather accomplished at handbell ringing, singing, folk dancing and (in one case) flute playing! The score, by Christopher Nightingale, weaves traditional carols into the action through a series of beautiful arrangements, performed by the actors and a small group of offstage musicians. A handbell arrangement of Silent Night involving the whole cast is a fittingly moving conclusion to the evening. Dickens’s masterpiece has been around for so long that it’s easy to forget why the timeless ghost story remains a December staple. Using cast members, often speaking in unison, as a sort of multi-bodied narrator, this production relishes the original language of Dickens and famous phrases like ‘dead as a door-nail’, ‘God bless us every one’, ‘today? Why, Christmas day!’ and of course, the immortal ‘Bah! Humbug!’ There is a festive thrill in the almost ritualistic telling of such an enduring tale, and its message of charity, community and love will hopefully never get old. Book A Christmas Carol tickets!